Historically, New Jersey's first settlements were located along waterways, particularly the Hudson River waterfront, Newark Bay, the Raritan and Passaic rivers and the Delaware River and Bay. Despite the efforts of Lord John Berkeley and Sir George Carteret to attract settlers to the lands granted to them in 1664 by the Duke of York, New Jersey's population grew relatively slowly, as its neighbors benefited from their advantage in serving as ports for both overseas and domestic trade. 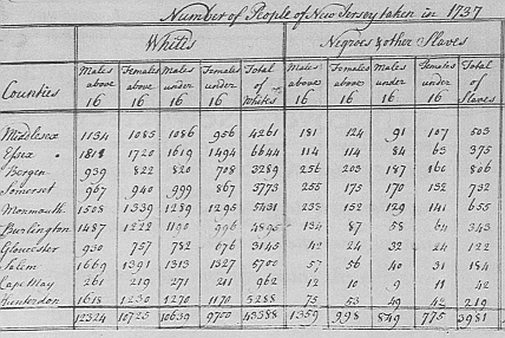 In 1702, New Jersey's population was estimated at about 10,000, Pennsylvania's at 15,000, and New York's at 20,000. New Jersey's own population primarily clustered in towns across the rivers from Manhattan and Philadelphia, leading to what would become cities like Jersey City, Hoboken, Newark, Elizabeth and Camden. Inland waterways and rivers would provide sites for such towns as New Brunswick, Perth Amboy and Paterson. 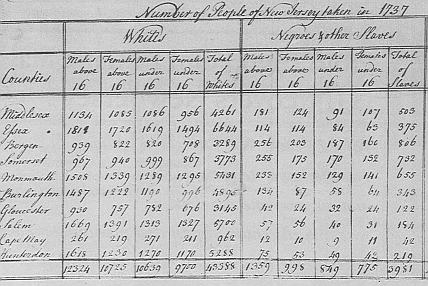 In the first census taken in 1790 which reported a total state population of 184,139, of the 13 counties in which the state was then composed, Hunterdon had the largest population with 20,153, followed closely by Sussex at 19,500 residents. Cape May had the smallest population with just 2,571 residents. Commencing in the 1830s, population growth increased rapidly, fueled by New Jersey's gateway location for immigrant labor and its position on the central railroad corridor which supported industrial development. In the decade from 1850 to 1860, the state population grew by 37.3% and from 1850 to 1900 New Jersey's average population gain over ten years in each census would average 31%. Most of the growth occurred in the cities, as Newark, Jersey City, Paterson and Camden evolved as major manufacturing centers, attracting workers who typically resided in densely populated neighborhoods near their workplaces. Following the end of the Civil War, newly-freed slaves also came to the state, expanding the African American population of previously freed slaves and those who had remained in the state after escaping the South and traveling on the Underground Railroad, where they often found refuge in New Jersey. Foreign immigration coupled with the prosperity of the 1920s led to another surge in growth; from 1920 to 1930, the state's 28% gain in population nearly doubled that of the nation's. After European immigrants completed their processing and medical examinations at Ellis Island, they would typically board a ferry to the Central Rail Road of New Jersey Terminal in Jersey City, in which they would gather in the Immigrant/Emigrant Waiting Room to wait for their trains, thus segregated from contact with daily commuters using the terminal to and from New York City. The Great Depression of the 1930s, however, led to a sharp reduction in immigration, with only a 2.9% growth rate from 1930 to 1940, partly due to a decline in birth rates and federal curbs on foreign immigration to reduce competition for scarce jobs. In the 1940 census, New Jersey's rate of population growth would lag the national average for the first time since 1850. The post-World War II "baby boom" brought a renewal of growth. In the 1950s and 1960s, population increased in each decade by over one million persons, with much of that gain focused in rapidly developing suburban towns made more accessible to employment centers by new highways and expanded commuter rail services.